How many of my readers are more excited about Black Friday then they are Thanksgiving Dinner Preparation! I know a lot of you are. I have a great way for you to get prepared, to utilize your time wisely, and to not miss any of the great finds! Find&Save is the perfect online tool that you can utilize from your tablet, mobile and web browsers. Find&Save arms you with the tools you need to research local sales, products and retailers in your area while finding the deals you specifically are interested in. 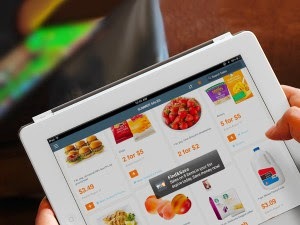 You can map store locations, create shopping lists and even get deal alerts sent to you. Do you tend to be an early bird or night owl shopper?? I don't care to shop on Thanksgiving, and by the time I have cooked all day and cleaned up.. I am not interested in staying up late to go shopping. I would be more apt to hit the 7:00am sales, but much before that I would struggle with. The wonderful thing about Find&Save is that I can check online in my own area, I already have access to the Black Friday circulars for Target, Walmart, Kohls, Meijers and more. Plus the option to be emailed when the other circulars are posted. No need to wait for that newspaper to come in anymore with all of the specials! I can look at the ads directly from Find&Save without even leaving the site! What an awesome service! It will work great not only for Black Friday but even for your basic grocery shopping. Find out weekly who has milk or hamburger on sale for the week. So here I am several days from the big event and already have a good list organized for the stores I have been able to check already! How slick is that? On Find&Save you can browse by stores, brand, or category of products. Have the kids handed you their wish lists? You can type in the specific product and find the best deal on it in your area. The all new app for ipad allows you to take your lists on the go. Easily get organized and look for deals. The app also includes a favorites tab for easier following. I am getting an iphone next month I hope and the Find&Save app will be one of the first ones I put on! I was very impressed with this program and it will be a huge time saver for both Black Friday and in the weeks leading up to Christmas! This was a promotional post, all opinions however are solely my own. Good to know! What a wonderful tool! :) THANKS! Can't wait for it to be on iPhone!